Harlem-based rapper who first gained fame with his LiveLoveA$AP mix tape. His first studio album Long. Live. 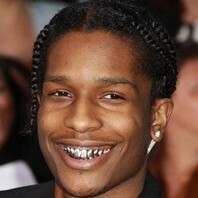 ASAP debuted at #1 on the Billboard 200 in 2013 and earned him a nomination for a BET Award for Best Male Hip-Hop Artist. He stars in the 2015 feature film Dope. EXCITED TO BE BACK IN THE UK 🇬🇧 NIGGAZ NEED TO GIVE ME CITIZENSHIP ALREADY!